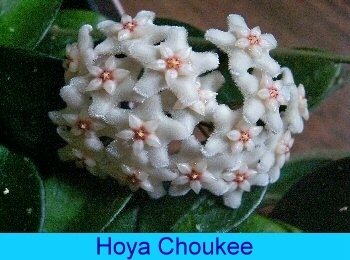 Hoyas may be propagated by seed, or stem or leaf cuttings. The seed pods can take months to ripen. Once they have ripened, the seed pods split and the seeds are dispersed by the air. To prevent this if you wish to collect seeds, cover the seed pod with gauze or old nylon stocking material. Once the pod splits down its length when gently twisted, the seed floss can be removed from the seeds. This seems to prevent "damping off" of the seeds and seedlings. Use only freshly harvested seeds, these seem to germinated better. 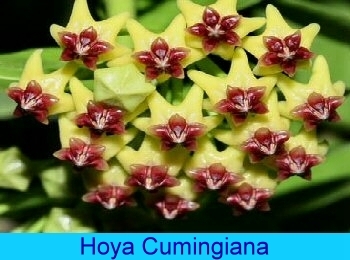 Seeds may be started in pots or flats. The seedlings seem to grow faster in large batches. Use a good quality soiless potting mix enriched with 30% perlite or pumice and water only from below. Cover the newly planted seeds with a thin layer of dry potting mix. Once the seedlings start to develop true leaves, repot and plant out separately. Propagation from stem cuttings is relatively easy. Use a cutting with 2 to 3 leaf nodes. Remove the leaves from the lower node, dust the end with rooting hormone powder and bury in a good soiless mixture with 30-40% added perlite or pumice. Water to thoroughly wet the soil and then allow to drain. Do not allow the soil to dry out or stand with excess water in a saucer. If you live in a very dry region, an occasional misting to raise humidity will help. Grouping plants together will also help to raise humidity. Leaf cuttings can be more problematic. The leaf should be placed in the soil at a 45° angle, with the stem buried to the base of the leaf. Rooting hormone seems to enhance rooting. Often leaves develop roots but do not go on to produce healthy plants.